These are also called spool insulators. 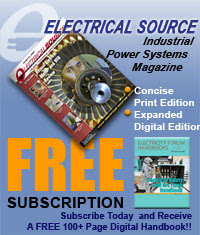 These are primarily used for low voltage distribution lines. These insulators can be used in horizontal position or in vertical position. 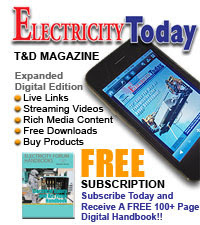 These are used at the dead end of the aerial wire of service connection to a house or a factory where there is excessive mechanical stress on the line. The Fig. 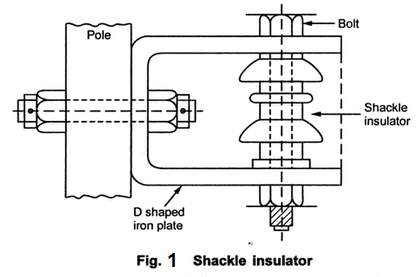 1 shows the shackle type insulator. The insulator is round. It has through hole in the centre for the bolting purpose. On each side of the insulator, there is galvanized iron plate of 25 mm wide. The other end of plates are placed around the cross arm of the channel or pole. The conductor is in the groove and it is secured with the help of soft binding wires. Similar to the strain insulators, these insulators are effective when there is dead end of the distribution line or the distribution line changes its angle.